Or view larger version. 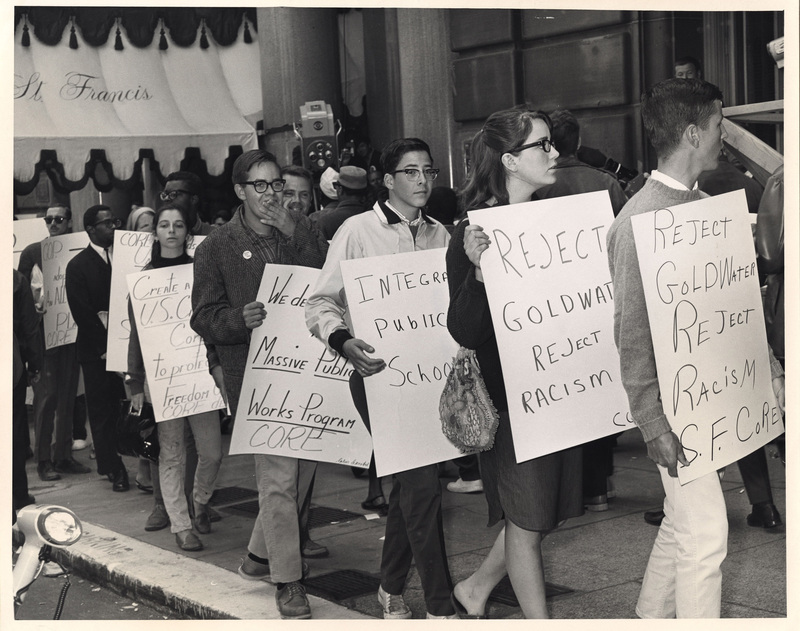 A line of protestors picket outside of the St. Francis Hotel in San Francisco during the presidential campaign of Barry Goldwater. 1964. Howard Erker, photographer. Gelatin silver print. Collection of Oakland Museum of California. The Oakland Tribune Collection. Gift of Alameda Newspaper Group. This photograph was taken in 1964 of a picket line outside the St. Francis Hotel in downtown San Francisco during the presidential campaign of Barry Goldwater. The protestors were supporters of CORE, the congress for racial equality. They were demonstrating against Republican presidential nominee Barry Goldwater, against racism, and for the integration of public schools.